I bought a Samsung tablet about a year and a half ago and meant to use it at my gym to listen to music during my cardio sessions. But I started watching a TV program and didn’t need the tablet for that. So the tablet didn’t get much use in spite of the many excellent features it had. Anyway, I switched gyms and the new gym is still working on getting the cardio room squared away so that people can plug headphones to listen and change channels on the bank of televisions. So I finally started using the tablet. I kept the tablet in a plastic bag to keep the screen from getting all scratched up when it was in my gym bag because I had (as one example) a metal lock for the lockers. Anyway, one night I’m walking home from the gym (proximity to my home being a big factor in my gym-switching decision) and had some water leftover from my water bottle in the bag along with my tablet. And when I opened the bag I noticed that a little bit of water had gotten on the bag with the tablet. I didn’t see any water ON the tablet and didn’t think anything of it. Six or seven hours later, my tablet suddenly came on. It came on so brightly it woke me up. And I couldn’t shut the darn thing off. I literally finally took it into a different room. When I woke up, the tablet had the opposite problem; I couldn’t turn it ON. Even after putting it on the charger. I vaguely remember buying a warranty when I bought the tablet at Sam’s Club. But danged if I could find the receipt. I had kept everything in the box. Which is when I remembered – to my horror – that I had let my nephew use the thing. And of course he’d very probably (being a kid) just tossed the useless pieces of paper to the side somewhere. So I didn’t have the receipt and couldn’t even remember when I’d bought the darn thing. The only thing I had was a PDF manual I’d downloaded subsequently to purchasing the tablet. And I went to the properties to see when I’d downloaded it and then tried to match that approximate date to my credit card bills. And was able to see a purchase amount for the ballpark figure to what the tablet would have cost. So I called up my Palm Desert Sam’s and talked to Esmerelda at the customer service desk. And she went to work for me. No, I didn’t buy it when I assumed I had; I’d bought it a couple of months earlier. She gave me the item number for the tablet, told me that yes, I had bought a warranty and the tablet was still covered, and told me I could come in and they’d print me out a copy of my receipt. Armed with that, I called my warranty service, which was a company called Asurion. I told the representative what happened. My warranty did NOT cover water damage. Heck, they could have denied me my claim right over the phone, but the fact that I’d had the thing in a plastic bag was enough for them to grant me the benefit of the doubt that water probably didn’t get on the unit and therefore the cause of the thing not working would have been something else. They switched me over to a tech, who listened to my story again and again gave me the benefit of the doubt regarding water damage. He had me try a couple of possible fixes over the phone. They didn’t work. So he gave me a UPS label to mail it to them. I sent it away on a Monday afternoon. I was bringing in the trash containers on Thursday when the UPS truck came by and screeched to a halt in front of my house. He had a package for me. From Asurion. Oh, oh, I thought. I assumed that they had looked at the tablet, concluded it was in fact water damage, and rejected my claim and sent me my busted tablet back. I mean, there was NO WAY they would have fixed it that quick and got it back to me. They even sent me a new USB cable and charging attachment. I’m not a rich man, so when I buy something for a couple of hundred bucks and it blows up on me, I’m in the “sad” category. And when I get something like that back, good as new, when I know that Asurion could have easily rejected my claim, when I know that Sam’s Club could have not gone the extra mile to research my purchase for me, well, I’m in the “happy and grateful” category. Anyway, I was so pleased I wanted to say “Thank you!” to all parties concerned. Not every business is honest, by any means. And even the honest businesses can’t come through every time for every customer. But Sam’s Club and Asurion sure came through for me, and based on my experience I am a big fan of both businesses. I Like Red Wing Boots. But What Happens When They AREN’T ‘Built To Last’? Update, March 14, 2012: I have completely changed my tune about Red Wing: as the comments below indicate, Red Wing immediately reached out to me and resoled my boots absolutely free of charge (even shipping). The customer service rep explained that there was a recall on the particular sole due to a defect issue (that I never found out about) and I sort of fell through the cracks. But Red Wing ultimately took care of me. To thank Red Wing for the customer service that I had always counted on, I also purchased a brand new pair of Red Wing boots (style #2233). As I have stated: when it comes to my feet, I want the best boots I can afford. I learned when I was in the Army that if you can have quality anything, get a quality weapon and then get yourself some quality boots. I will be editing this article substantially in the near future: but I wanted to immediately acknowledge Red Wing’s excellent treatment of one customer. But I’m not real happy about Red Wing these days. The latest addition to my Red Wing flock was a complete fiasco. I’ve been happy with the low quarters shoes on the right side of the picture; I’ve had them since 2006/07 and they’ve been great. 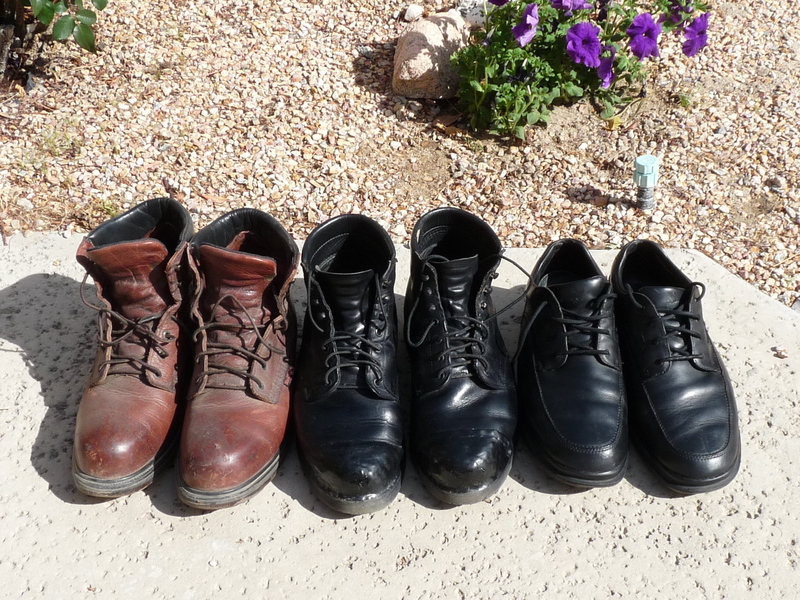 The pair in the middle are positively ancient; I bought them when I lived in Oregon in the 1980s and had them resoled this year (I have a complaint about that, too, and will talk about it later; but it’s minor compared to the remaining pair of Red Wing boots on the left side of the above picture). There is no question that Red Wing used to be a shoe and boot company of premium quality. The nutmeg boots that utterly failed about as much as a pair of boots could fail are Style #2406 (Nutmeg). I note that they are still for sale at outlets such as CityShoesOnline as of February 13 – though I was told when I called customer service that they were NOT sold online. He wasn’t interested in looking at my link to demonstrate otherwise. I bought these boots in late 2006/early 07 as well because they were on sale and I thought steel toed boots might come in handy. But I barely wore them and ended up storing them the exact same way and in the exact same place I’ve stored my other boots. 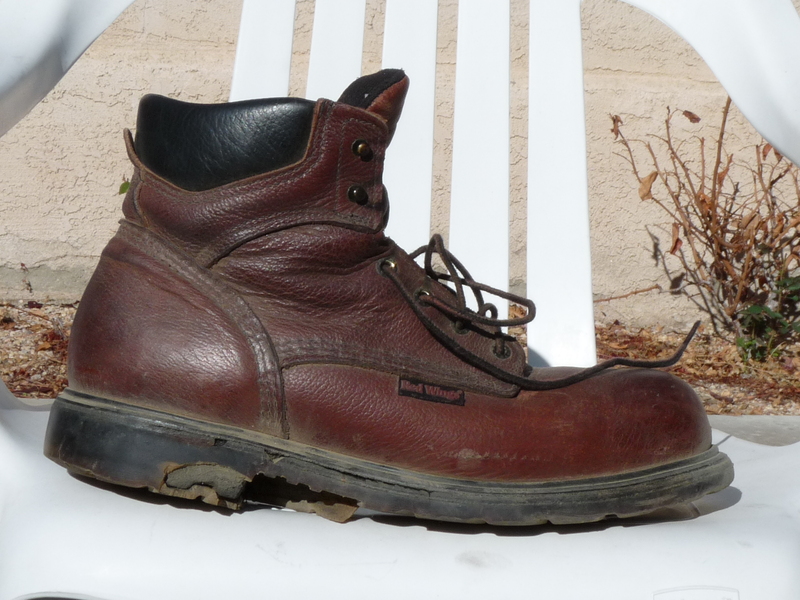 When it came time to have the black boots – again, that I’d had since the 1980s – re-soled – I dug out the Nutmeg Red Wings to wear on my hikes. I could provide more pictures, but I think it is rather obvious from these that the tread is virtually new. They had very little wear on them. But the soles just little fell apart. It’s like they still looked brand new other than the fact that they were disintergrating. When I picked up the boots I had resoled, I brought these Nutmegs with me (the Euclid store in Anaheim, California was also the store of purchse of the Nutmegs) and asked what Red Wing would do about it. He said he couldn’t do anything about it but told me to contact Red Wing customer service. He also said they could not be re-soled. So I called customer service. They told me only the stores could do anything. But that they could be re-soled. This frustrating exhange occurred following my sending three different emails to customer.service@redwingshoe.com and receiving not so much as a “go to hell” back from them. Red Wing “customer service” used to be a lot better; and the deterioration of their customer service has matched the deterioration of the quality of their products. The boots are obviously “out of warranty.” I understand that. Legally, Red Wing does not have to do anything. 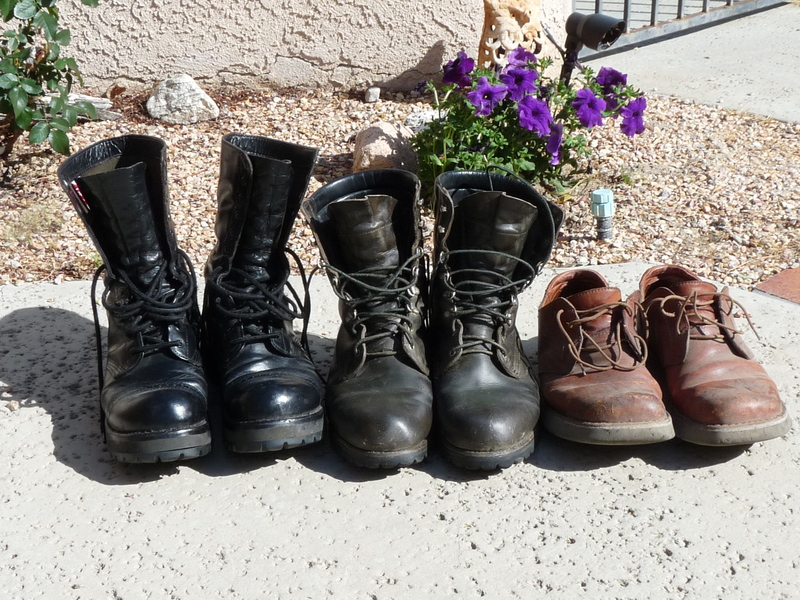 The pair on the left is the oldest; they are Corcoran “jump boots” that I was authorized to wear with my dress greens as a paratrooper in the U.S. Army. I bought them in 1983. Unfortunately, I scuffed the toe of one boot badly enough that they were no longer dress uniform “worthy.” And the sole of Corcoran jump boots is rather smooth and slick. So I had an additional sole added in 1984. And I have had them ever since. They are still fine; the soles are still fine. The pair in the middle are also rather ancient. They are Browning insulated and waterpoof boots. I bought them about 1988. I wore those on all kinds of hiking/backpacking expeditions. They are also still fine. 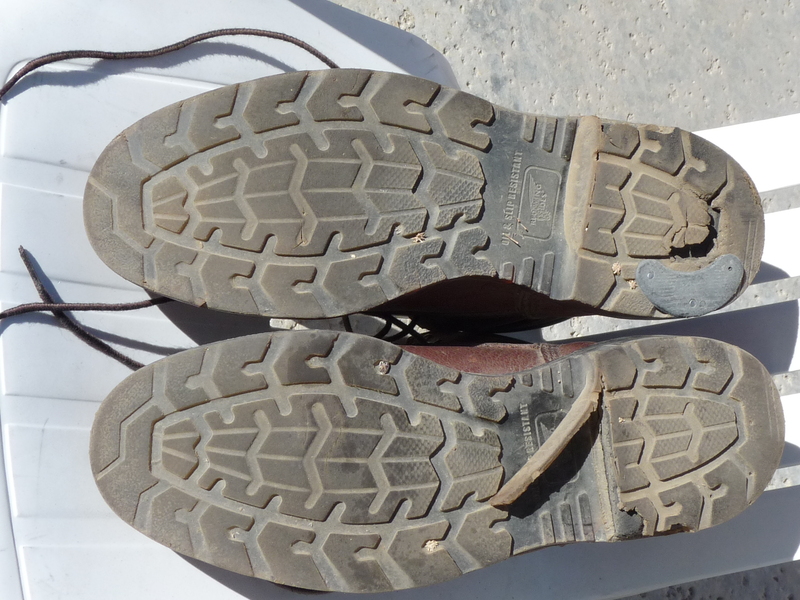 And the soles – while worn now – are still in decent shape. The third pair on the right is a surprise. They are Rockports, and I have had them since the late 1980s. 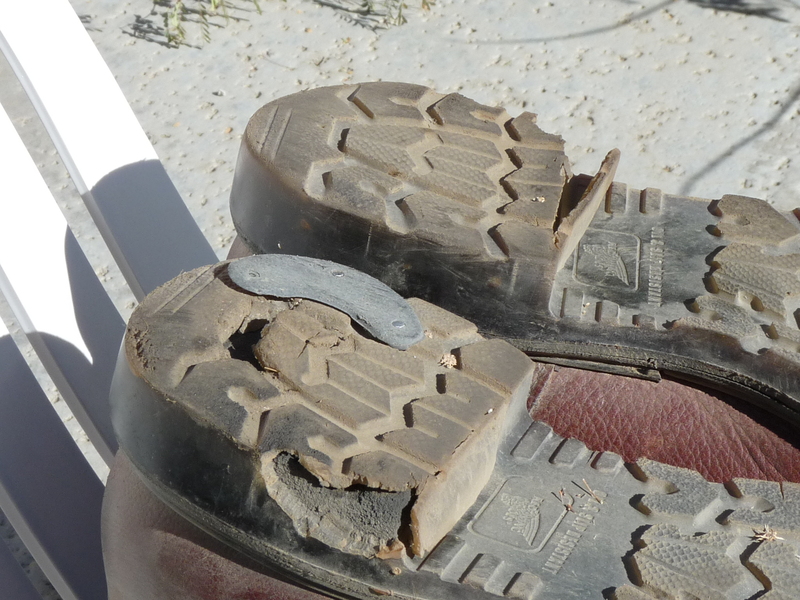 As ugly as the things are, they have lasted and lasted, and they are quite comfortable with my medical insole that doesn’t fit in most of my other footwear. The serious question is: How “built to last”? Do they last anywhere near as long as Corcoran? As long as Browning? As long as Rockport? Not anymore, apparently. Does Red Wing stand behind their products? Not anymore, they don’t. Are they “built to last?” Nope. 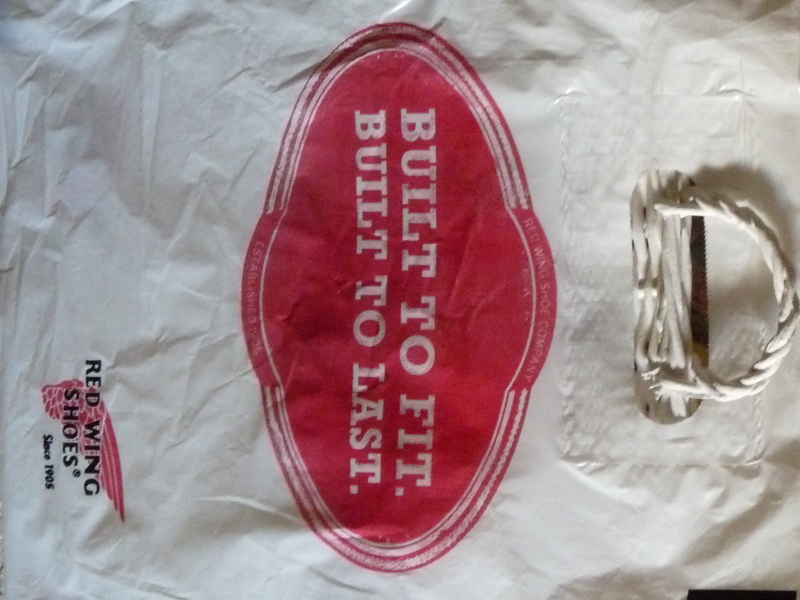 If you want “built to last,” you’d better look somewhere else. Am I going to be investing any more of my money on top-dollar Red Wing products that are no longer anywhere NEAR the level of quality they need to be to justify their prices? No. It’s amazing. I am seeing a marked deterioration in quality in nearly everything I buy these days. Practically nothing is “built to last” anymore. Btw, I mentioned I had a pair of Red Wing boots re-soled. Guess what? They had a one year warranty (which means you figure that’s the absolute minimum length of time they should last), and they managed to peter out just short of that period. But having already had my previous experience with Red Wing “customer service,” I didn’t even bother to complain.